Election Day (Tuesday, Nov. 6) is just one month away! 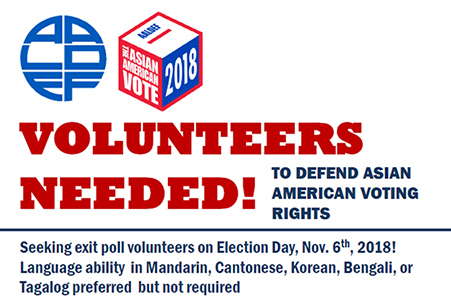 AALDEF is recruiting volunteers to ensure the Asian American voice is heard nationwide through our Asian American Exit Poll and Poll Monitoring project. In past elections, Asian Americans have faced a series of barriers in exercising their right to vote, including segregated “Asian” voting lines. When the news media reported on election results, Asian Americans were often overlooked. In response, AALDEF has conducted a non-partisan survey of Asian American voters to document Asian American voting patterns and instances of anti-Asian voter disenfranchisement. In certain states, AALDEF has also monitored the elections for compliance with the federal Voting Rights Act, which mandates bilingual ballots and forbids anti-Asian voter discrimination. In the 2016 elections, 800 volunteers polled 13,846 Asian American voters in 14 states and Washington, DC, the largest survey of Asian American voters. You can read our report on the Asian American vote in the 2016 elections here. Volunteers work in 3-hour shifts. There will be a 60 minute training session for all volunteers. There will be 90 minute sessions for CLE trainings; lawyers will receive 1.5 CLE credits (1 credit for professional practice and 0.5 credit for ethics). All volunteers must be non-partisan during the time they participate in this project. Sign up to attend a training session and to volunteer at www.aaldef.net. For GPS, use 66 Hudson St., walk up stairs and across the deck to 99 Albany St. entrance.